896 Mk3, FireWire audio interface from MOTU in the 896 series. 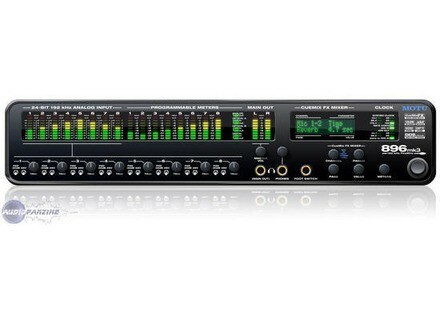 Product replaced by the MOTU 896mk3 Hybrid. 28 channel in/28 channel out firewire interface. On Mac I just love Motu. This is my 3rd Motu interface. On PC I'd rather use something like a Fire Face. Set-up is insanely simple, install drivers, connect, turn on...record. There is nothing I don't dig about this interface. AND it sounds great. Whether I use it for a mic pre or as my word clock. It comes with a software mixer that lets you run separate mixes. Actually I have used it as a stand alone mixer without computer. The small interface is a bit fiddly for this but it does work as described by the manufacturer. When you open the software mixer you have three panes. One for inputs, next is mixes, next outputs. You can run effects on the inputs or on the outputs. SO you have the choice to print them or not. It comes with soft clipping so you can hit the inputs without too much worry of digital distortion. My favorite of this is that when you're using it with another interface that has a fixed sample rate and you connect them via AES/EBU you can run the Motu at your project sample rate and convert at the AES/EBU outs. Or vice versa. Ingenious! Plus the fact that you can send different mixes to different sources, at this price makes it a great value for the money.